Bulldog Weekly is a new publication from the CCHS Touchdown Club. We plan to publish a new newsletter each week during the season, previewing the upcoming game and recapping the previous game. Issues are available here, or you can subscribe to receive each issue in your email inbox. Junior Juan Lopez (offense), and seniors Levinte Washington and Jonathan Rhone (not pictured) were named Dogs of the Week for the Druid Hills game. 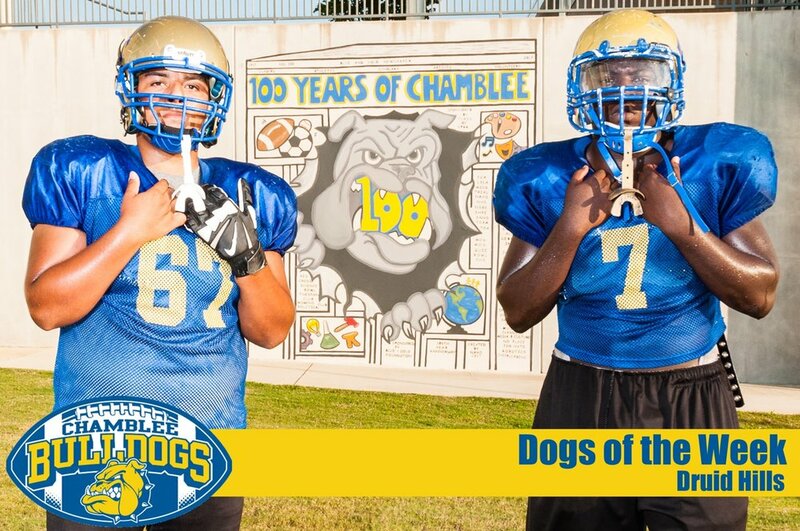 Preview of Roddy Jones night vs. Decatur and recognition of our Dogs of the Week from the win over Druid Hills. Also, a roster with player numbers. Sign up with your email address to receive Bulldog Weekly. We respect your privacy. We won't share your information outside of the Chamblee Touchdown Club. Arthur Murry (offense), Roberto Paz (special teams), and The Defense (Sherman Allen, Josh Tate, Jansen King, Levinte Washington, Gavin Holton, Adrian Russ, Shanti Williams, Princeton Byrd, Tyler McClinton, and Zamyan Wilder were Players of the Week. Wrap-up of the Columbia win and a look ahead at the Chamblee-Miller Grove game with a trip to the state playoffs up for grabs. Zamyan Wilder, Stuart Steele, and Adrian Russ were Players of the Week for Week 8. 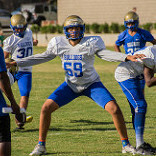 Preview of Chamblee-Columbia and Senior Night, and how Chamblee can get into the playoffs. Conner Whitley in the pocket at Hallford Stadium vs. Lithonia. Lithonia wrap-up and Arabia Mountain/Homecoming preview, plus a look at the JV's game against Druid Hills. Gavin Holton, Zamyan Wilder, and Jason Allen were Week 5 Players of the Week. A Southwest Dekalb preview, wrap-ups of the varsity game against Marist and the JV win at Lakeside, and a look at your Players of the Week. Conner Whitley, Jansen King, and Levinte Washington were Week 4's Players of the Week. Salem victory recap, Marist preview, your Players of the Week for Week 4, and a fundraiser at Taco Mac Perimeter scheduled for September 30th. Josh Tate, Tyler McClinton, and Jansen King were Players of the Week for Week 3. Preview of the Salem game, JV summary of first two games, Players of the week for Week 3 announced. Levinte Washington and Jansen King were Players of the Week for Week 2. Bulldog vs. Bulldog Friday night at Decatur Stadium. Some tips on parking for the game, a preview, and a roundup of the Opening Day game against Druid Hills. New head coach Curtis Mattair leads the Bulldogs against Druid Hills in an early Friday game against the Druid Hills Red Devils at North Dekalb Stadium. Learn about the new pregame Dog Walk, this season's tailgate party, and the team's new classification.